While it’s easy to think of arthritis as one big health issue causing joint inflammation and stiffness, the truth is there are more than 100 different types of arthritis. This alone makes treating the condition difficult. Around 350 million people globally are living with one or more types of arthritis, and it impacts around four million Australians. Treatments that work for one type of arthritis won’t work for another and with a myriad of information available, those with arthritis aren’t always managing their condition correctly. To help unpack some of the confusion, Starts at 60 spoke with two arthritis experts about the latest treatments and advice for the most common forms of arthritis. By far the most common type of arthritis in Australia is osteoarthritis, impacting around 2.2 million people. It also affects 27 million Americans and nine million people in the UK. It typically affects the hands, spine, knees and hips when the smooth cartilage lining of the joint becomes damaged. Rheumatoid arthritis, where the body’s immune system attacks its own tissue, including the joints, affects more than 400,000 Australians and 1.3 million people in the US, while psoriatic arthritis numbers in Australia sit at around 50,000. Psoriatic arthritis is an inflammatory joint condition that can affect people with psoriasis. People will experience different signs and symptoms, depending on the type of arthritis they’re living with, but early diagnosis is often key to putting effective treatments into place and managing symptoms going forward. “With osteoarthritis, it’s often the symptoms that cause people distress,” Andrew Mills, CEO Arthritis Australia, tells Starts at 60. People typically notice pain in the joints, knees or hips when they’re dealing with an osteoarthritis diagnosis. “Those symptoms are pretty obvious because you’re feeling the pain,” Mills explains. It’s important to talk with a GP or health professional as soon as possible so tests can be run to diagnosis arthritis. This may include blood tests, x-rays, ultrasounds or MRI in some cases. For other types of arthritis, the condition won’t be picked up through traditional x-ray imaging. Most types of back arthritis are non-radiographic and will need to be diagnosed through MRIs or blood tests. In inflammatory types of arthritis, patients will typically be referred to a rheumatologist for further investigation. In psoriatic arthritis, for example, a dermatologist may also be required because it’s a condition that also impacts the skin. It’s also possible for people to be living with more than one type of arthritis at one time, which can complicate matters even further. It’s important not to ignore symptoms, to seek support and really get to know the condition you’re living with. Two-thirds of people with arthritis aren’t actually managing their condition well, which can lead to increased pain or side effects. Unfortunately, because arthritis is an umbrella term given to more than 100 different conditions, it’s difficult for professionals to suggest a universal treatment. What works for one person won’t always work for another. 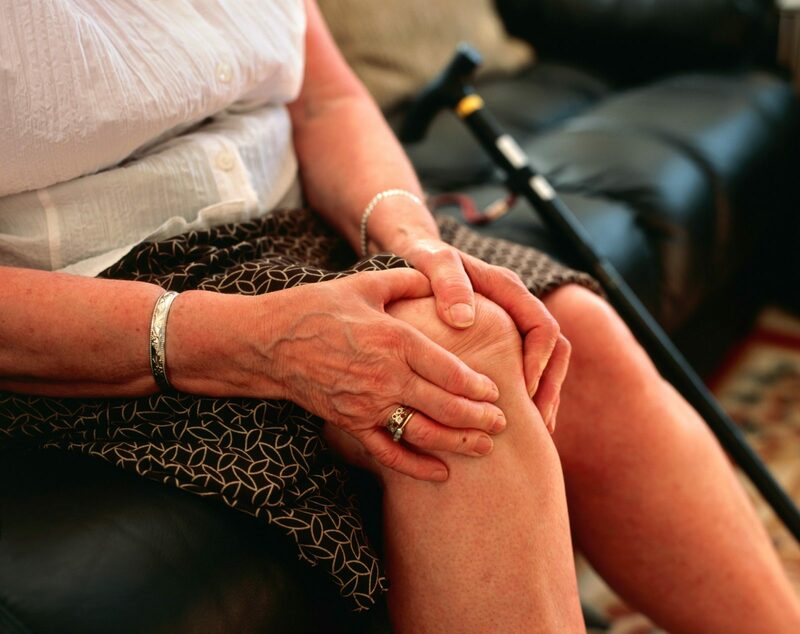 “Someone with osteoarthrosis of the knee at an age of 80 has a different arthritis to someone maybe in their 50s who has an inflammatory autoimmune arthritis affecting their hands and their feet with swelling and pain,” Irwin says. There are no cures at present for any type of arthritis but there are effective treatments for inflammatory types of arthritis such as rheumatoid arthritis, psoriatic arthritis, and ankylosing spondylitis, which affects the spine and large joints. Treatments for rheumatoid arthritis range from non-steroidal anti-inflammatory drugs (NSAIDs) to corticosteroid medicines or injections to disease-modifying anti-rheumatic drugs (DMARDs) or biologicals. NSAIDs, DMARDs and biologicals can also help manage psoriatic arthritis. 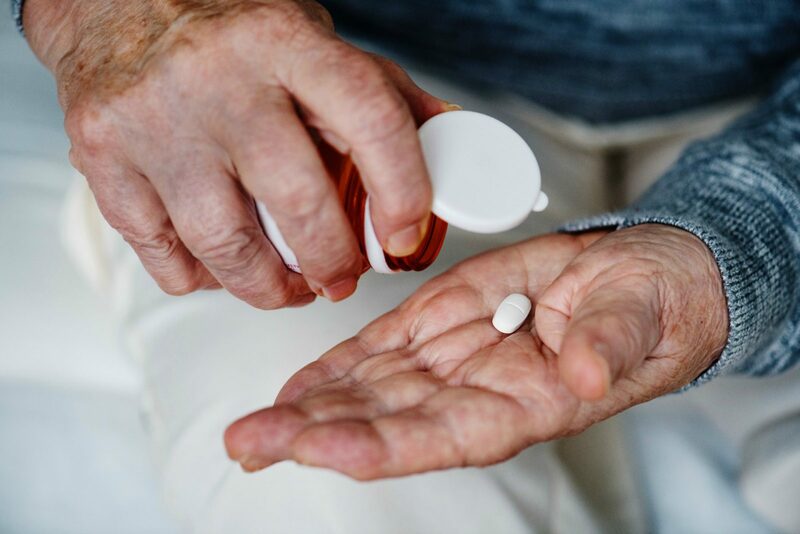 Sadly, there are no effective medications for osteoarthritis, but NSAIDs can offer temporary relief. The problem is these creams and pills can’t be used long-term because of side effects including stomach pain, heartburn, headaches, dizziness, liver and kidney problems, allergic reactions, increased bleeding and leg swelling. Doctors will often recommend patients use them for a week or two to manage short-term pain. If they do need to be taken for a longer period of time, the doctor will carefully monitor the patient for side effects. Factors such as genetics, the environment and lifestyle and diet choices can also affect how arthritis will impact individuals. Read more: Supplements for joint pain: Do they really work? What role does exercise and diet play? Like many health conditions, exercise is vital when it comes to muscle, ligament and tendon function. While arthritis can make it difficult to keep physical, exercise can help maintain bone density, keep the body moving and as strong as possible. Exercise can help reduce pain, increase and build strength, as well as improving balance and joint function. Older people should be participating in at least 30 minutes of regular fitness a day, but it’s common for people with arthritis to become less active because of fear of pain. These activities can include swimming and water exercise classes, tai chi, low-impact aerobics, strength training and even dancing. 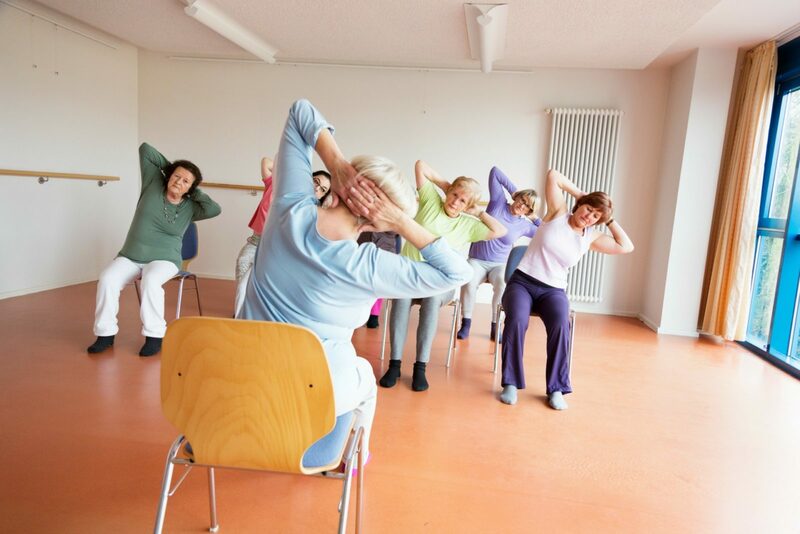 From a chair, there are also plenty of activities which can assist with strength, balance and movement. The “sit to stand”, for example, requires sitting on the edge of a chair with your toes directly in line with your knees. The aim of the exercise is to push yourself off the chair without actually using your arms to do so, which strengthens the thighs and buttocks. The “seated knee lift” is another example, which is as simple as pulling an exercise band over the thighs and sides of the chair and lifting one leg at a time against the band to improve the hip muscles. What is being done by researchers and professionals? To tackle the growing arthritis problem, Arthritis Australia launched a national strategic action plan in March, outlining key priorities for preventing arthritis, investing in research and improving treatment and support for people living with the condition. 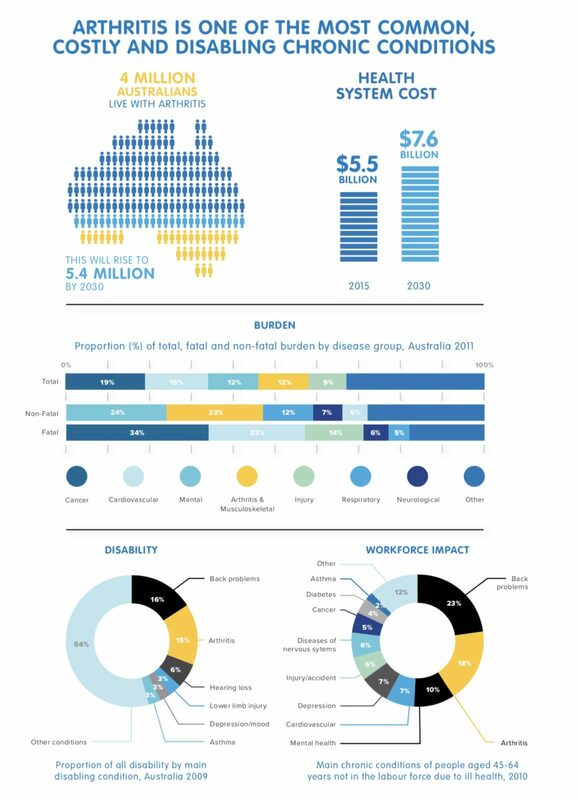 At present, annual arthritis healthcare costs exceed $5.5 billion in Australia, with Arthritis Australia calling on governments at all levels to invest in implementing the action plan as a way of transforming future outcomes and quality of life for people living with the pain of arthritis. Awareness, prevention and education is a key priority, particularly because misconceptions can undermine prevention and few people with arthritis are receiving the right information and support to help them manage their condition. And, with two-thirds of Aussies admitting they’re faring badly with the condition, another priority is offering high-value, person-centred care and support so people receive adequate pain management, information and support at an affordable price. The third priority is an investment in all levels of research to better understand arthritis and how it can be managed and treated better. If you’re experiencing any signs or symptoms that could be associated with arthritis, it’s important to talk to a GP or health professional as soon as possible and to ensure the right advice and treatment plan is established for your needs. Are you living with arthritis? What impact has the condition had on your overall health and wellbeing?